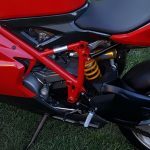 Contributors at RSBFS look at a lot of bike ads, and though these two are for the same year, make, and model, the auctions couldn't be more different. 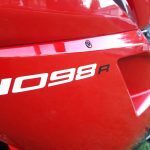 A smashing contribution to the sportbike encyclopedia, the 1098R returned Ducati to the cat-eye fairing, and Troy Bayliss to the WSBK podium. Something reminiscent in the single-sided swingarm and separate underseat exhausts, but all new in the 1198cc testa, with 12.8:1 compression and 180 hp. 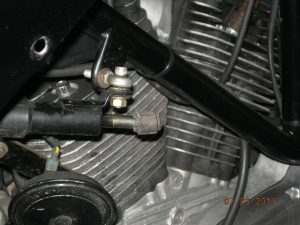 The -R's titanium valves and connecting rods can't be seen, but can be felt like the magnesium fairing sub-frame and aluminum seat sub-frame. 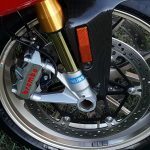 More visibly, Brembo supplied billet Monoblock brakes and Öhlins the fully adjustable fork and twin-tube monoshock. 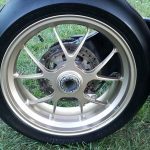 Forged and machined Marchesini alloys provide light gold accents. 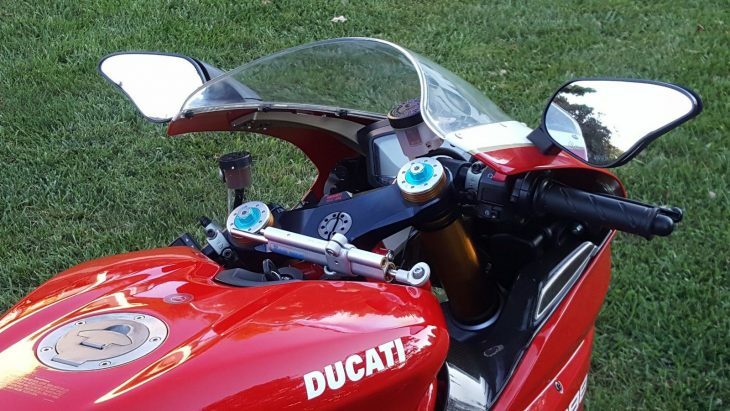 The race-derived dash has settings for the new traction control system, taming the 1098 along with the hydraulic slipper clutch. 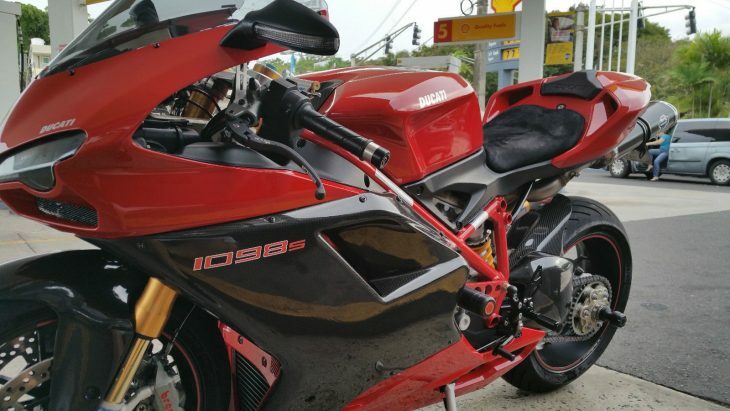 Both from the east coast, neither of these 1098R's have more than 1,500 miles, and #212 has under 300. #154 shows quite a few views of the bike out on the lawn, while #212's single picture might just be a factory glamour shot. Both are as expected for such low miles. Spare comments from #212's owner presume a studied buyer, while #154 gives a little recent history, along with what seems to be a paragraph lifted from a review. 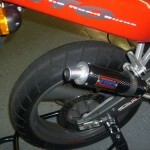 -R's were supplied with a racekit ECU and carbon Termignoni mufflers, but neither are mentioned here. #212 - Only 275 original miles. Perfect condition, #212 numbered out of only 450 ever made. 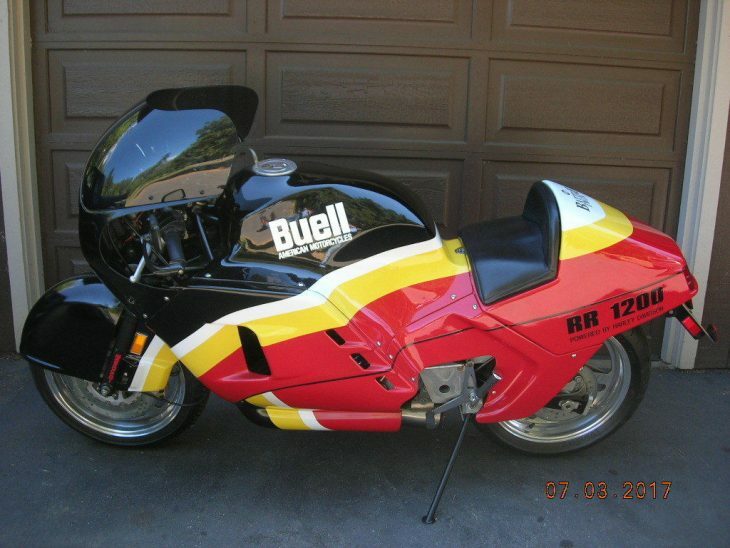 A rare opportunity to own a special motorcycle. 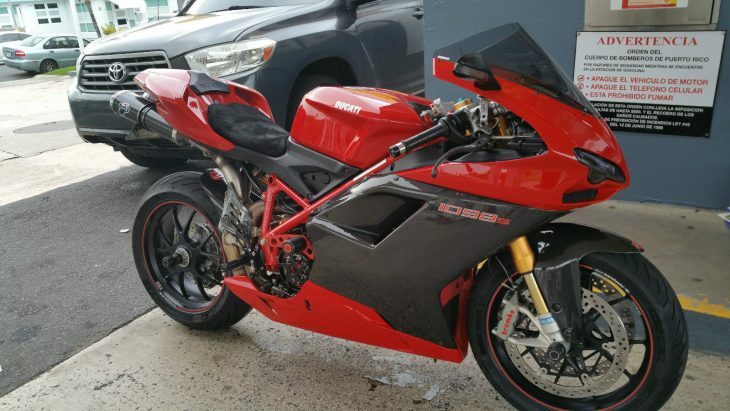 #154 - Ducati 1098 R with 1400 miles. 1 owner clean PA title. 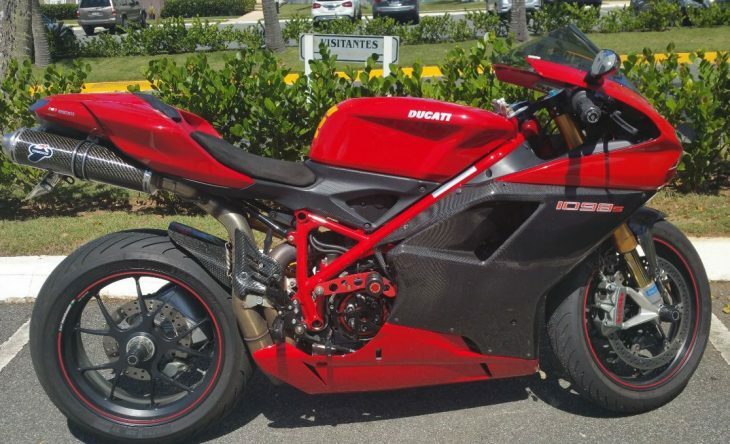 This exotic bike looks and rides like new. Recent oil change, new plugs, new air filter, and new battery. 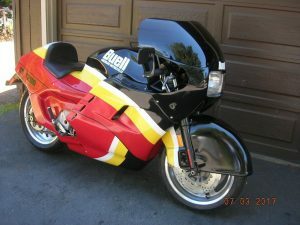 On the upswing in the later 20th century, Erik Buell was a sharp engineer who developed a succession of street machines from his weakness for race bikes. 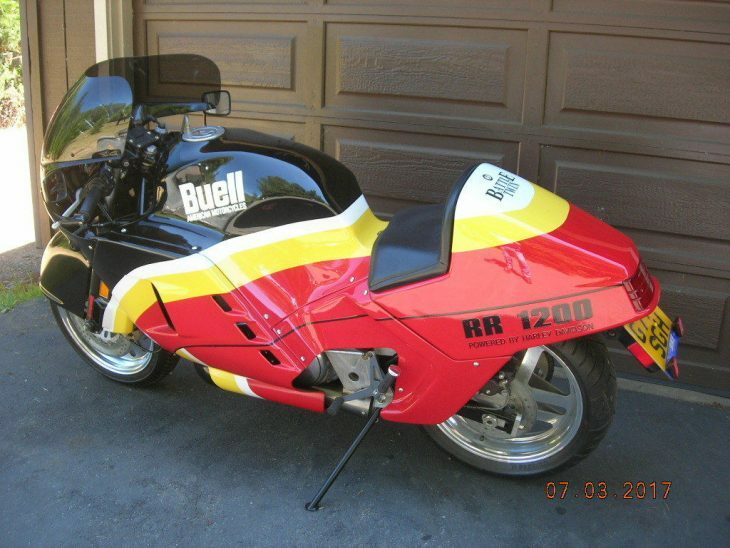 The RR1200 Battletwin was based on the classic Harley-Davidson twin, expanded to 1198cc, used Buell's own "isoplanar" engine mounts, and had a contemporary streamliner body. This example has traveled the world but covered just 567 miles, and has been readied for its next assignment. 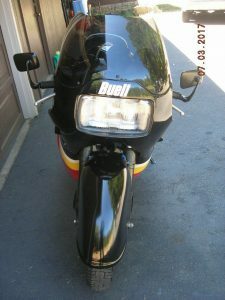 Buell actually began his racebike work with a two-stroke 750cc square four powerplant, but a short affair with H-D turned his career toward the 45-degree twin. The pushrod-actuated two-valve per cylinder Evolution engine used on the RR1200 makes 68 hp at just 6,000 rpm, and 72 ft.-lbs. torque. Lighter than the engine's usual carriage, the Battletwin's trellis frame and aerodynamic fairing keep the 4-speed usable. 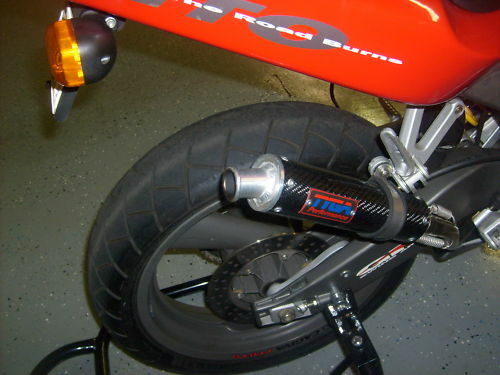 Buell's own brake design and underslung monoshock are just a couple of the innovations on board. The full soapbar takes a lot of flack but does protect the rider and slide through the air. 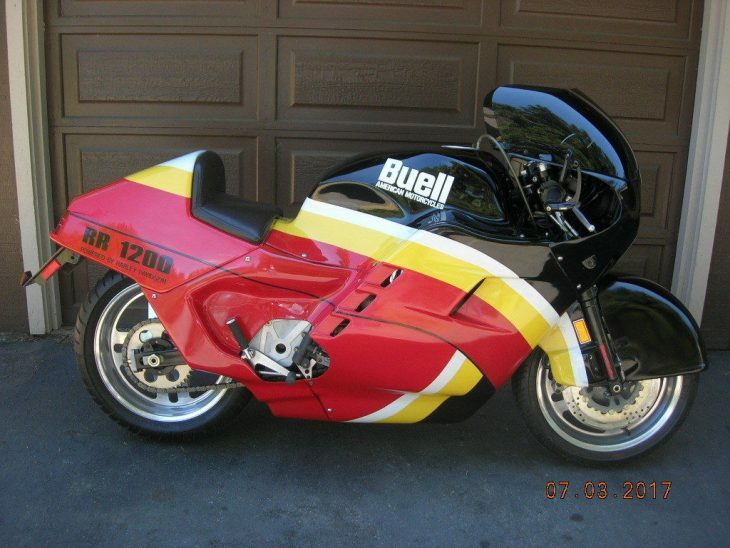 THIS IS A ORIGINAL, UN-RESTORED BUELL 1200 (RR)!!! 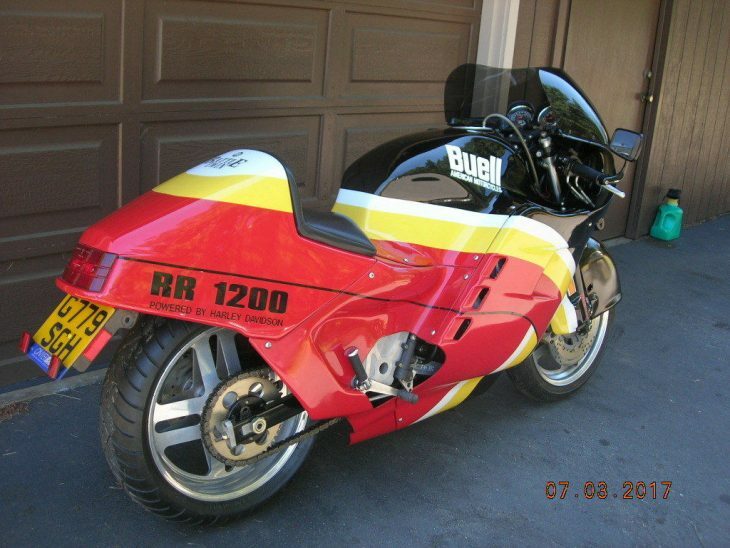 THE 1200(RR) WAS ERIC BUELL'S THIRD MODEL. 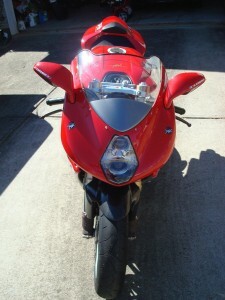 IT FEATURES A TRELLIS FRAME AND EVOLUTION 1200 CC ENGINE. 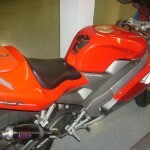 THIS BIKE WAS SOLD NEW BY WARR'S HARLEY- DAVIDSON IN LONDON, ENGLAND TO A PROMINENT MEMBER OF THE BUELL OWNERS GROUP. IT CONSEQUENTLY WAS BOUGHT BACK TO THE USA TO BE SOLD BY BONHAM'S, AT A AUCTION IN CALIFORNIA. 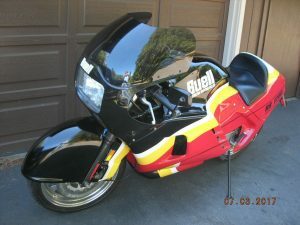 IT THEN WENT TO AUSTRALIA WHERE IT RESIDED IN THE HARLEY-CITY COLLECTION!!! 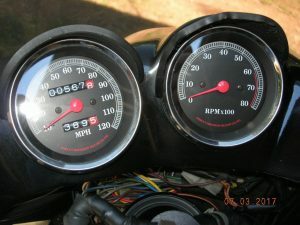 IT WAS FULLY RECOMMISSIONED 12 MONTHS AGO WITH ALL SYSTEMS FUNCTIONING AS YOU WOULD EXPECT FOR A BIKE WITH THIS MILEAGE! 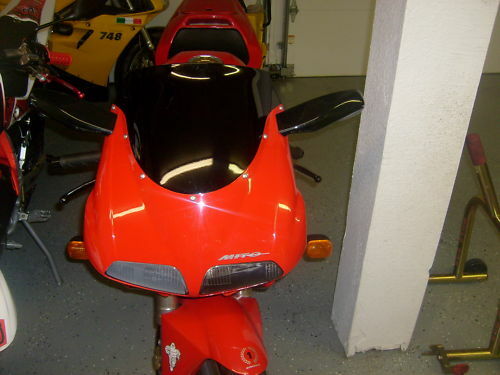 THIS BIKE PROVIDE A GREAT CHANCE FOR A MUSEUM,COLLECTOR,CAFE RACER OR BUELL ENTHUSIAST TO PURCHASE A TRULY COLLECTIBLE MOTORCYCLE, AT A REASONABLE PRICE. 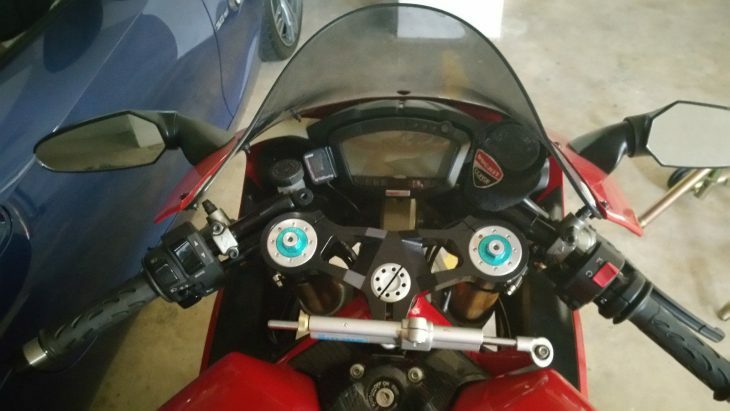 THE BIKE WILL COME WITH A NEW BATTERY. 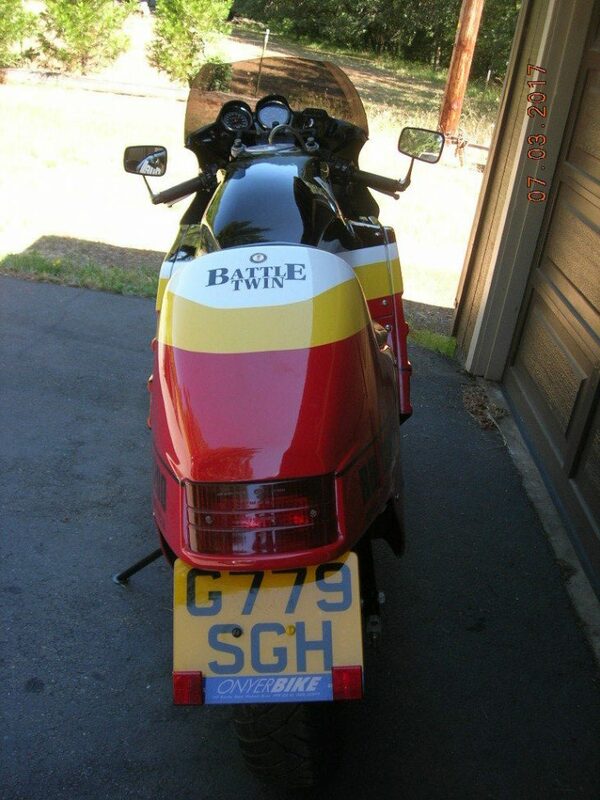 THE BIKE IS OFFERED WITH A CLEAR TITLE!!! 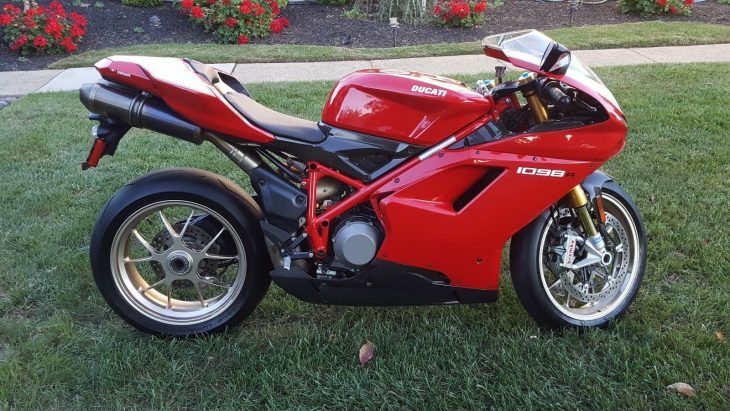 Back to a more classic Ducati Superbike look after the 999 years, the 1098 revitalized sales and led to a WSBK win and Bayliss replica. The -S model has upmarket dampers, exhaust, and wheels, and the EVO testastretta engine and revised cooling system were welcome updates. 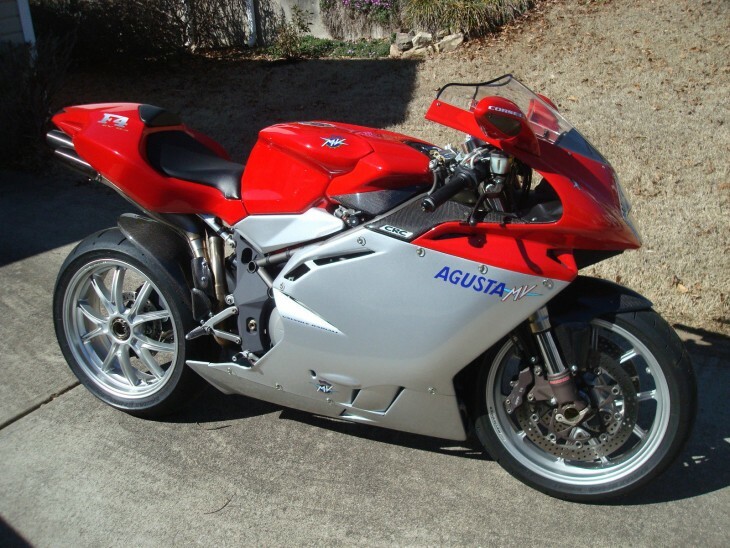 Nicely farkled, this 1098S looks ready for a boat or plane ride. 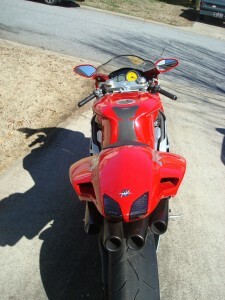 With 160 hp and 90 ft.-lbs. 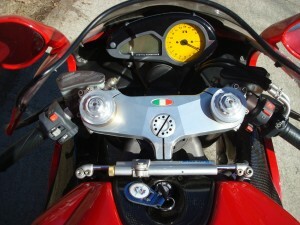 torque, the 1098 reviewed as too much for the street, even as the desmodromic valve adjustment intervals increased. 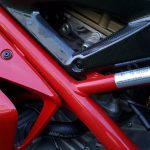 The chrom-moly steel trellis frame, here finished in red, has top line Ohlins at either end, with forged and machined Marchesini alloys underneath. 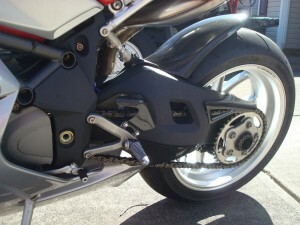 Brakes are car-sized Brembo monoblocs, the billet calipers fitted to a street-legal bike for the first time. 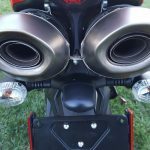 Waving goodbye to the underseat canister muffler, the 2-into-1-into two system with Termignoni carbon mufflers. Digital data-logging dash has track-oriented functions. 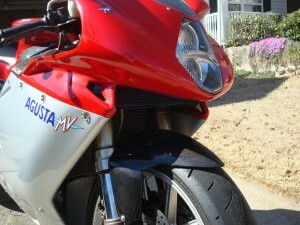 Carbon Fiber (Rear hugger, Swing arm protector, Side panels & Frnrt Fender (Small crack on a corner, nothing mayor). 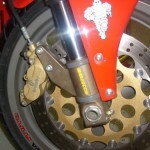 Italian Moto GP clutch and front brake swivel levers. Complete Engine cover slider kit protects (motor& Water/oil pumps. 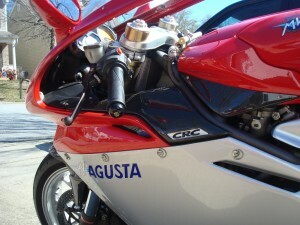 A dynasty like no other, MV Agusta won 63 world championships from 1948 through 1980, in all classes of Moto GP. 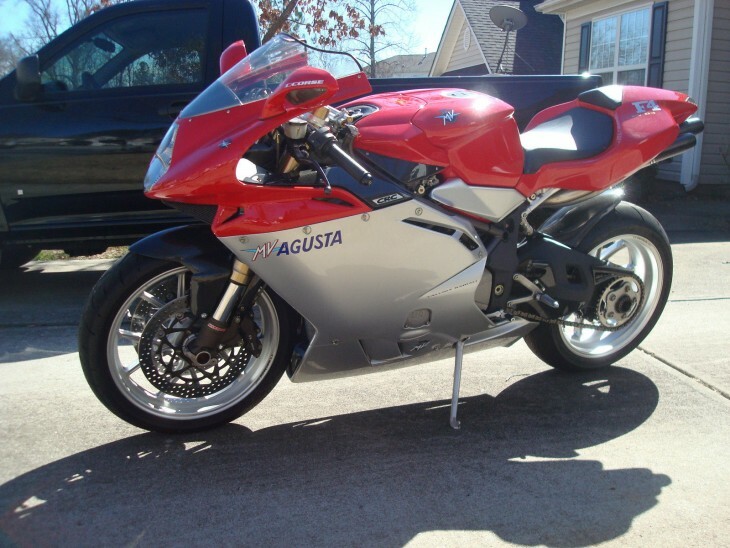 After the death of the founder's son Count Domenico Agusta in 1971, the drifting trademark was revived by Cagiva in 1991, which re-introduced MV Agusta cycles in 1997. 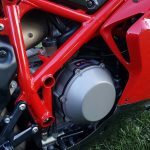 Now-legendary designer Massimo Tamburini had recently completed the Ducati 916 and leg the Cagiva Research Center in their efforts, consulting with Ferrari on the new design, especially the hemispherical combustion chamber. A true exotic, the F4 was built in very low numbers of around 300 per year, and generally cost more than double what more popular machines could ask. The radial array of 4 valve per cylinder is derived from the Ferrari Formula 1 engine, generating 137hp at 12,500 rpm. 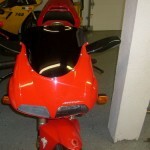 The bodywork, which was carbon on the 1998 show bike, is mostly fiberglass, as the magnesium parts of the original F4 are now generally aluminum. Brakes can only be considered extreme with 6-piston calipers gripping 310mm front disks. 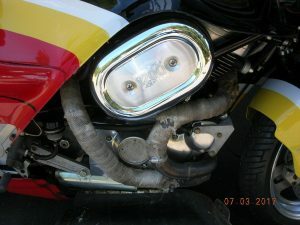 The often-copied underseat exhaust has 4 small mufflers. 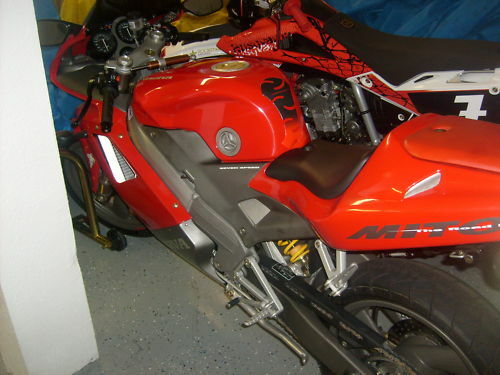 A lovely and light package, capable of 170 mph. 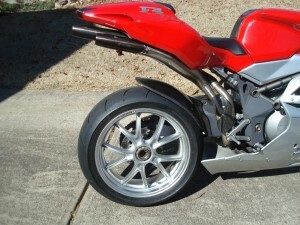 Carbon fiber fenders, exhaust guards, ignition guard, etc. 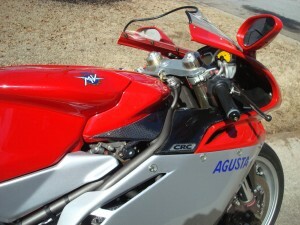 Factory improvements to the F4 750 were mostly cosmetic in 2003, as MV Agusta prepared the 1000cc model for introduction. 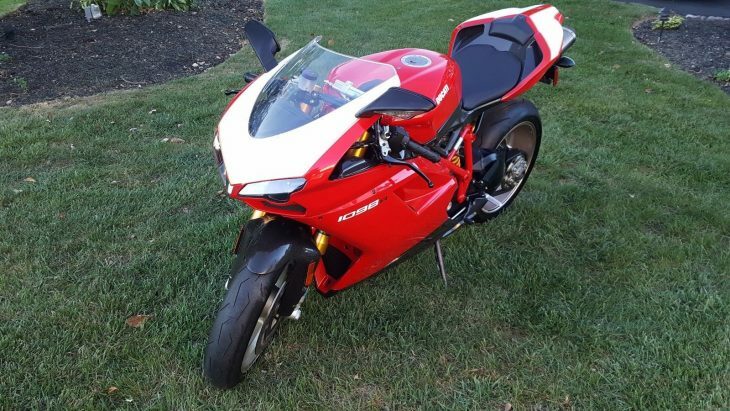 The one has some nice improvements, and is looking to be in excellent shape, with spare tires and matching leathers ( if you're 5'10" and 155 lbs. ). It is kind of funny how something can be very ordinary in one place an exotic in another. These little Mitos, in my opinion, are classic bikes. 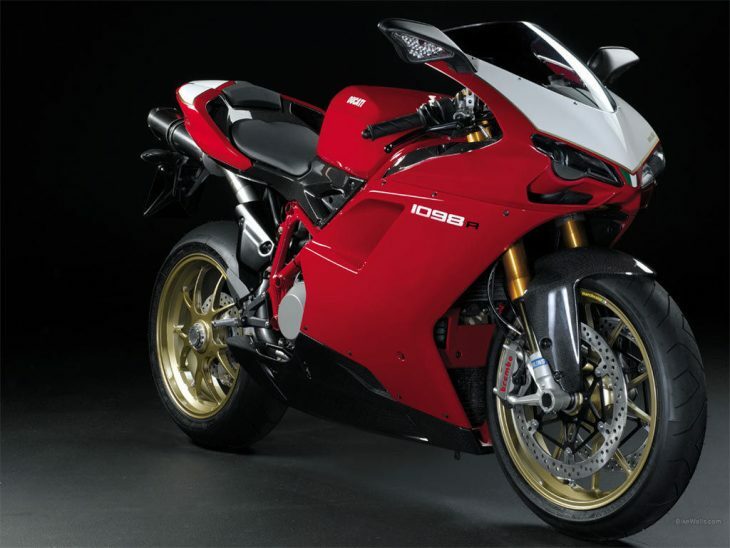 Their design/look is timeless much like, say a Ducati 916. Could it be because the same pen designed them? 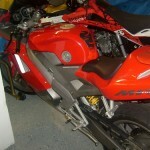 Maybe but park this next to an Aprilia RS125 and tell me which is the newer bike. What makes this impressive is that the Mito is considered a beginners bike and they usually look like, well: beginners bikes. Only the tiny exhaust and single disc give away its' lack of cc's. You may recognize this garage, as it has been producing some extremely nice grey bikes for sale lately. Lucky for us the seller has decided to thin out his herd. Lets go down the checklist for the bike. Title: check. Low miles: check. Extremely clean: check. There really isn't a whole lot to say. If you've been waiting for a Mito to come up for sale here it is. It has everything you could ask for. Can you see the 916 now? This one is just smaller and smokes. 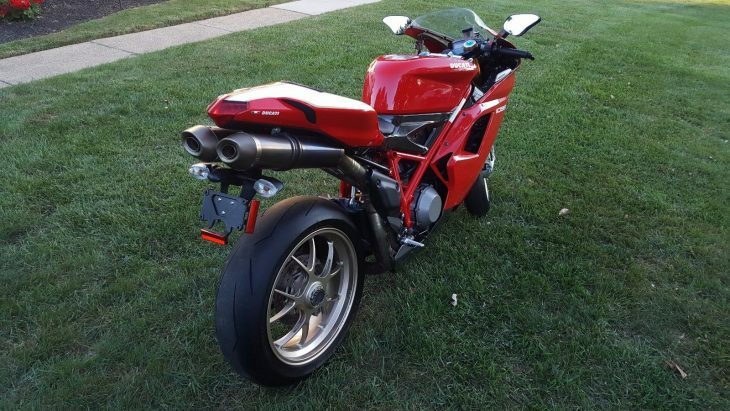 I'd love to see some comments from owners about these bikes. Do they motivate pretty good? 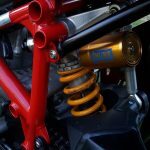 I think back to my RM125 dirt bike and remember that thing was pretty damn strong. 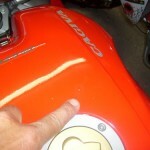 Did Cagiva plug it up with restrictions and if so, are they easy to remove? 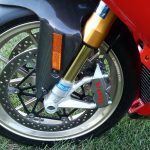 What is the fit and finish like on a Cagiva as I've never seen one in person. I think this is one of those bikes that if you got it in your garage you'd find yourself riding more than you thought you would. I'd take in a heart beat if my wallet would only cooperate. This one is another Ebay bike and it looks like it has attracted a few bidders although the price is still well below what I think the seller would let it go for. 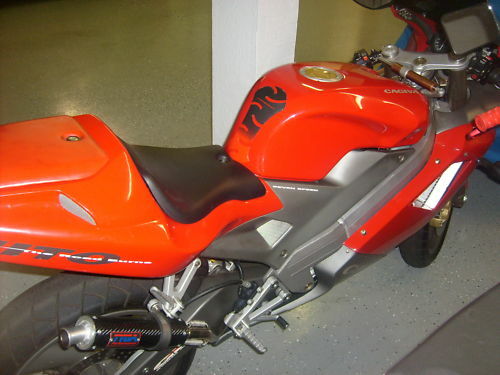 Since I compared the two, here are the RS125 and the Mito together. In all honesty, they are both sharp looking bikes.